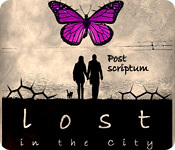 Lost in the City: Post Scriptum is rated 4.2 out of 5 by 25. Rated 5 out of 5 by iou001 from 8 Years Ago I bought this game 8 years ago and for some reason I never played it until now. I love it. 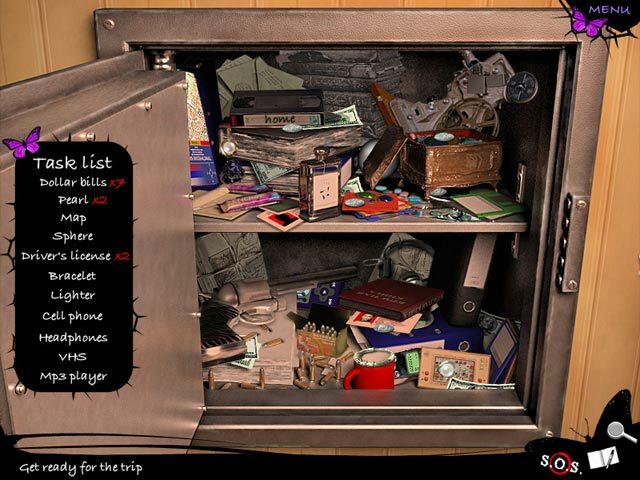 It has a bunch of hidden object scenes, the graphics and storyline are good and I didn't want it to end. 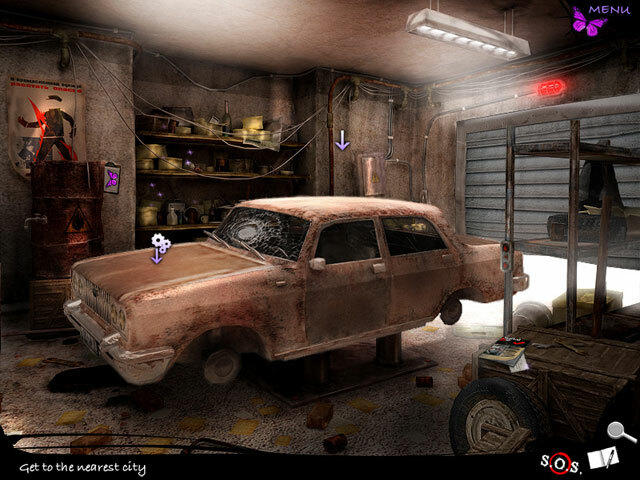 I wish I could find more games with as many hidden object scenes as this one has. And I love hunting for the butterflies. Rated 5 out of 5 by colorsplash from A great Game for hidden adventure players An absolutely wonderful older game. Why don't they make these anymore???? Rated 5 out of 5 by smilingsun72 from Fascinating! Absorbing! Complex story...makes you think! Emotionally Human! This picks up where the first story ended...years later though It has a different story and puzzle system. I love this story just as much as the first. I like that the HOs are not a random list of objects to find. 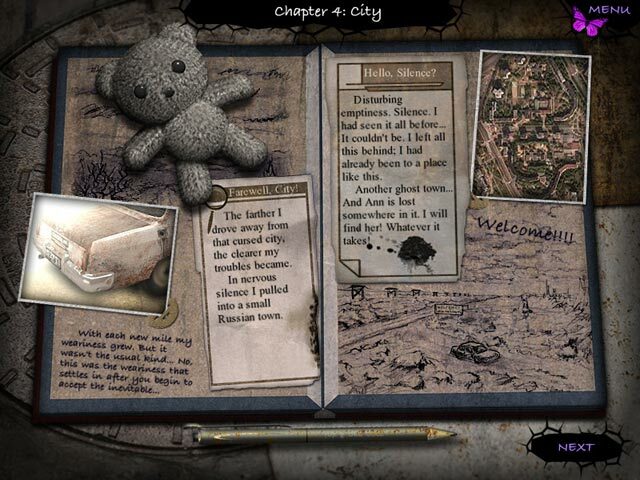 You collect objects in line with the story, and sometimes bits of information are given. The developers put a lot of time into this series story to make it stand out. I recommend this game and Lost in the City! Rated 5 out of 5 by Amijane from This is just so...strange...and wonderful! I loved the first one and this is even more fantastic! It do have HOS but they are not stupid or strange but just adequate and the graphics have improved and the story is just as great and intense as the first one....Like so many else have said I don't know really why it gets me so enthralled but it truly does! This is something out of the ordinary! Rated 5 out of 5 by ThisBrevity from Do NOT Miss This Game! I thought that this would be too outdated, and I’m not even entirely sure how I stumbled across it since it is not a newer game. That being said, it was one of the more memorable games I’ve played this year (2014). Although you do have to read some, it’s not nearly as much as I got the impression from by reading the reviews (nowhere near as much reading as in, say, Ravenhearst). What really surprised me about this game was that I bought it DESPITE the fact that it had much more HOGs than I prefer. I am not a huge fan of more than just a few HOGs, personally. But the story was so good, I couldn’t put it down. It also is CLEARLY not just a “crank it out” formulaic production like so many that we get from popular developers nowadays. It had heart. It was well thought-out. It was philosophical and beautiful. *NOTE: I did not, like many others here, play the first “Lost in the City”, and that was fine (although perhaps someday I will). Just an FYI in case anyone was worried about having not played the original! LIKES: -The STORYLINE carried it. I thought this was very original, although it did take me a little while to get into it. I could go on about it, but I would really rather that you see for yourself. I’ve played tons of HOPA games, and this stands out among them despite its age and the fact that I just now discovered it in 2014! -Music was good -Long length -Diary adds depth to the experience; you get to ride the rollercoaster of his experiences and thoughts, going through the all-too-human struggles of change, leaving your comfort zone, acceptance in the face of a loss, and jumping off into the proverbial unknown for the sake of love and life. -Uplifting story despite its stark and often-serious feel, and definitely amusing at times. It’s worth it to find out what happens in the end! -Characters you can like and respect – especially the character you are playing. Most of the time it seems that there isn’t nearly as much thought expressed about the individual character you are playing…they are not really unique or distinguishable from any other character you’ve played, usually. This character has a fierce and selfless love of his partner that is inspiring and admirable, although I wouldn’t say this is a love story. -The cat. No, you don’t need to like cats to like this game, but if you DO like cats, you’ll just like it that much more! I enjoyed that this cat was “realistic” – not walking on hind legs, speaking English, or whatever. Just a sweet little black cat that befriends our character and provides him a sounding board for his thoughts, as well as fulfilling that strongly powerful need for a sentient, warm companion (don’t forget to click on the cat occasionally to see the character’s thoughts and get “feedback” from the cat). The cat waking him (you) up in the morning totally cracked me up…I am very familiar with that particular view he opened his eyes to! DISLIKES: -The graphics were where you felt the age of this game. Besides not being the best, they also just aren’t always that pretty because you’re in, well, a rundown city. But you get some cool and pretty scenes closer to the end of the game. Somehow, the subpar graphics didn’t detract from the experience for me. I have about a dozen new games that I have played the demos for, purchased, and am waiting to continue…most of them new and popular HOPA games…and this one still was the one I wanted to continue playing first, playing it long into the night (unfortunately for my work schedule the next day!) -I definitely would have preferred fewer HOS, but again…somehow it didn’t bother me as much in this game as it usually does… BOTTOM LINE: There is something about this game that I cannot put my finger on, as other reviewers have said, that made me like it so much. It’s poignant, thought-provoking, and refreshingly different. But somehow I just can’t properly describe what’s so special about it. You’ll just have to see for yourself! Rated 5 out of 5 by Little_Selkie from U Lost? This is the first game in hundreds I have played that made me sit back as the credits rolled and reflect on life and afterlife and basic human comfort and strength. It was…strange. And a very peaceful aftermath of an incredibly soul touching game. Reading the other reviews before I took on this game, I thought people were over-exaggerating but weirdly enough, I feel that the game has an intense meaning and is beautifully crafted to bring it across. Yes, this is definitely not for everyone. It has no voice-over at all, and it has a lot of reading compared to almost any other game I have played. It is very slow, and very full of HO's, the graphics are old-school and somewhat grainy, and the length of the game is about average. Normally these are all things I am not a huge fan of but I absolutely loved this game. The premise has been explained by other reviewers but let me explain why this game deserves five stars. The lack of voice-overs actually make the game much more powerful…you are in a post-apocolyptic world, alone, no one is with you, and the deafening silence and quiet music make you, as a player, completely ally with your character and genuinely feel the weight of an empty world. When you meet a cat you rescue and it meows, I actually jumped a bit, the sound startled me. As you travel further into the world, the cat is threatened to be separated from you, and I actually teared up a bit (call me sentimental, but it has never ever happened to me before in a game). It brought home how much we crave and need other warm bodies in our life…the epitome of loneliness was very raw. This game is sad. And stressful. And silent. And desperate. But it is an amazing amazing storyline and literally sticks in your thoughts and makes you second guess your actions in life. It's a very basic gameplay with very basic HO's and puzzles. If you don't like reading and no map and no directional hints and no voice-overs and a slower pace, then don't get this game. Maybe try the demo. But if you want a lengthy, deep and beautiful storyline with a comic-book/manga feel and serious plot, go for it. Jump in and meet the Chessmaster, save a starving cat, overcome massive odds, stand up for true love, be the white grain of rice, and make your way through the dark. Happy gaming, fellow Fishies! Rated 5 out of 5 by Butterchop from I Love This Game I really like this game. The Atmosphere is different than any other game. It made me realize that the world, is so big. And i have to live it. The thing i like in this game, is that... They have to separate, and go to their adventures of their own, and then meet again in the end. The feeling of being in deserted town really excites me. This game is telling me about pain, and love. I really want more of this game. This game is so fantastic. Rated 5 out of 5 by sandysamuel from As good as the first! When I rated the first one, I didn't realize there was a second. I did find it and boy am I glad! I stand behind what I said about the graphics in the first one, but the hints were better this time. There is one thing I didn't like as much about this one. This is a game about a guy racing against time to find his true love. The first game had each section timed for ten minutes each. If you didn't finish in time, you had to do that section again. This edition is even more focused on time, yet the games were not timed. Maybe it's just me, but being timed helps provide that sense of urgency that really drew me into the game. I didn't have that feeling this time and it took away just a wee bit of the fun. The way the game ended makes it seem like that is it. I hope not. I really enjoy the challenges of this game and would love to see what the creators can come up with next. Rated 5 out of 5 by jocasta1 from A fitting sequel to Lost in the City I really enjoyed the first installment of the series and was not dissapointed in the sequel. It has a great story...the world has fallen into a coma and our hero must save his beloved and the world from an unknown force. Interesting artwork, wonderful ideas, and lots of tech stuff to do!! HO scenes are good as well.